The spiritual successor to the famous Roller Coaster Tycoon series is getting its own set of paid DLC today. If you’ve been enjoying Planet Coaster spin of go-karting, we’re happy to tell you that these new DLC packs are focused on just that. The first of the three packs is the long-awaited Back to the Future pack. In this pack, you’ll get the iconic DeLorean Time Machine kart for your go-kart tracks. You’ll also get various themed background objects and track pieces, letting you create an awesome Back to the Future track. There’s a big, backlit sign of the Back to the Future logo, and there’s even a special 88MPH flame trail special effect. The second pack is based off of the 80’s hit TV show Knight Rider. 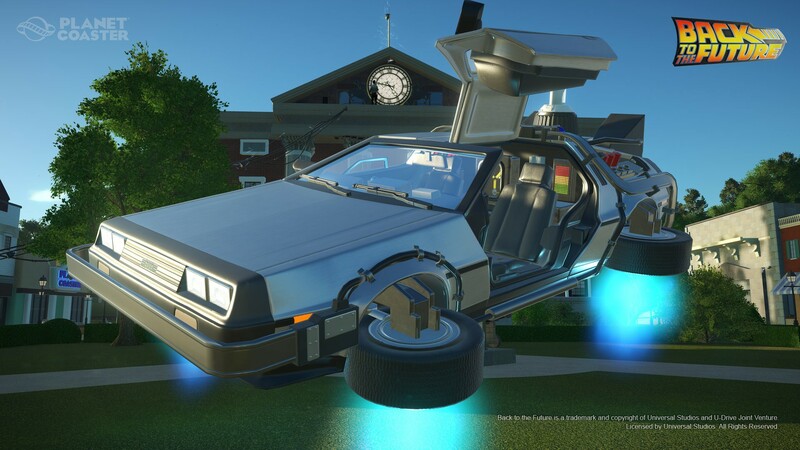 This pack will give your park visitors the opportunity to drive the legendary AI-controlled vehicle K.I.T.T. K.A.R.R, the evil autonomous version of K.I.T.T is included as well, so you can recreate some crazy battles on the track! Well, as crazy as a go-kart track can get. The third pack takes us way back in time, specifically the 60’s. Remember The Munsters? I certainly didn’t, but that was way before my time. The Munsters was an American sitcom that featured a family of monsters that, aside from their obvious monsterly apperance, acted like a normal everyday family. The family car was known as the Munster Koach, and now it’s yours to drive for your go-kart tracks. Each DLC pack will run you £1.99 / $2.99 / €2.99, and they are available on the Steam store page today! Do note if you do not own the respective DLC packs, you won’t be able to implement Steam Workshop items that feature them into your park. You’ll be able to subscribe to them if you’d like, but you’ll need the pack to actually use it. We hope that Planet Coaster will get some cool new licensed DLC in the future!